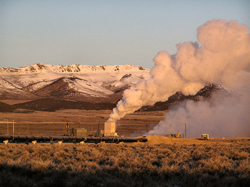 Photo courtesy U.S. Geothermal Inc. The Raft River geothermal project, 40 miles southwest of Burley, is the first geothermal power plant in the Pacific Northwest. The plant takes hot water from within the earth?s crust and turns it into electrical power. It is scheduled to start generating power by October.